Recently, I have made several trips to the end of South Point Road to show visitors the Southernmost point in the United States. 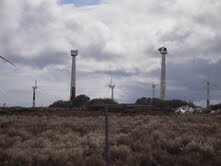 These remnants of a wind farm make me wonder just how environmentally conscious it is to let these stand. New working turbines have been built to take the place of the old ones, but what will we do with these discarded and useless turbines?